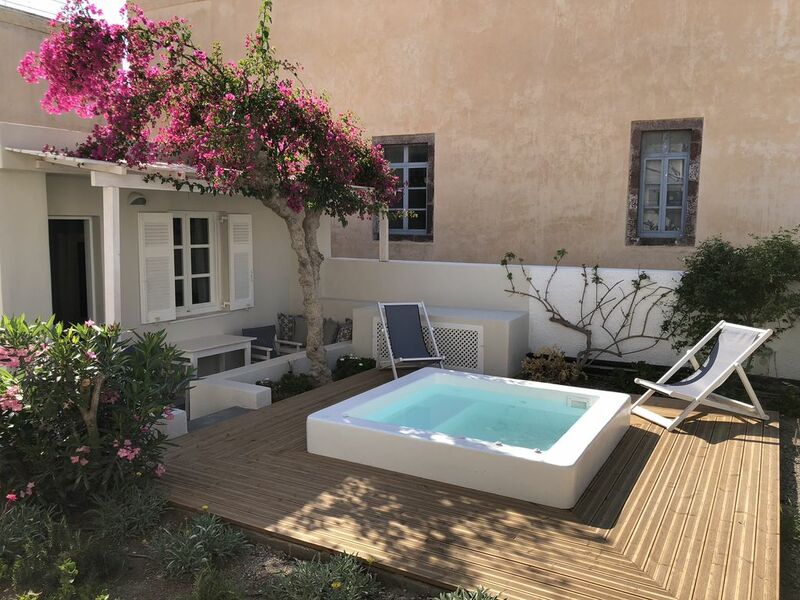 This spacious little house with Jacuzzi is located at the center of the village of Oia next to the Maritime museum of Oia. The king size bed and and the hot tub will give unique moments of relaxation and enjoyment! The house is located at the center of the village, next to the Maritime museum of Oia and just few steps away from the main pathway. All of Oia is within an easy walk, including the famous Oia sunset, cafes, restaurants, private chapels and shops. Also it takes 5 minutes walking distance to reach the main square where you can find the taxi and bus terminal. The recently renovated garden studio (22sqm) features one bedroom with a double bed, a private bathroom with shower and a fully equipped kitchen. The backyard is also equipped with a hot tub and patio furniture. Fully equipped kitchen, ,Sat TV, Air condition, backyard equipped with patio furniture, hot tub, Wifi internet. Daily cleaning service, we provide bath towels and sheets ,porter service, car or bike rental on request, booking local island tours, transfers on request.